The longer I took Stonehenge Health Dynamic Biotics and the more I researched it, the more I didn’t like it. I ended up giving it 1.5 out of 5 stars and have quite a few issues with this product. First off, it’s super expensive! It’s about $44 for a month’s supply of probiotics. I wouldn’t be upset paying a higher price for something that works but unfortunately this probiotic didn’t. The company also tries to upsell you into buying bundles of 3 or 6, which end up being close to $200! And the kicker is that they make it seem like the price is much cheaper than it really is and you don’t get the final number until it’s in your cart. Also, within seconds of landing on their website, I had 3 different ads, offers, and pop-ups show up. It’s excessive and annoying and super sales-y. I’m not a fan of these types of sites that are really aggressive with upsells and pop-ups. Second, the strains and CFU count are just too high. It seems like the more the better, but not in this case. You get high hopes thinking the high counts and high price tag make it something phenomenal. 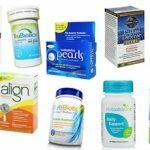 With the vast majority of supplements that have 15+ strains and 30 billion+ CFU, I almost never see any results and usually get side effects. And like I mentioned earlier, this probiotic just didn’t work at all for me. This product is also only safe for adults and isn’t safe for children or women who are pregnant. You also have to take the probiotic on an empty stomach or in between meals. I do like the fact that this supplement is allergy friendly, vegan, and free of preservatives and fillers. That’s probably the best thing about it. And the fact you don’t have to refrigerate it is a plus. Thank goodness this product has a 90-day money back guarantee! Because if it didn’t I would’ve taken it all the way down to 1 star. So overall, I’m not impressed with this probiotic. The ingredients in Stonehenge Health Dynamic Biotics are a little confusing to decipher. On the box and website description, it says 50 billion CFU. But on the actual bottle and online picture says 51 billion CFU. That’s obviously not a massive discrepancy but it’s just weird that they don’t have the same information all around. As for the strains, there are 16 of them. Both the strains and CFU count are incredibly high. This is definitely going overboard and too many of each isn’t always a good thing. But I do like one of the strains in particular, which is B. longum. This strain has been shown to be useful in combating seasonal allergies and upset stomachs. It also has anti-inflammatory properties which helps soothe GI issues and it helps prevent diarrhea from antibiotic use. I also like that they include NutraFlora® Prebiotic Fiber (FOS). This acts as a type of fertilizer for friendly bacteria and aids the growth of the bacteria colonies. I don’t like the use of L. casei in the lineup. This particular strain is relatively overpowering and can take the place where other good bacteria in the body would’ve been. 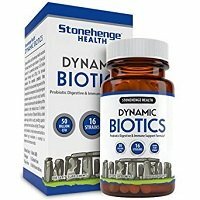 Stonehenge Health Dynamic Biotics seems to be very allergy friendly. It’s non-dairy, gluten free, and soy free. The capsules are vegan and don’t use any GMOs or preservatives. They also don’t use any synthetic binders or fillers or magnesium stearate. It does contain rice flour, which is an issue for some people. Here’s a list of the other ingredients used: Vegetable Cellulose (veggie caps), Rice Flour, Vegetable Grade Kosher Calcium Palmitate E, and Silica. You can buy this probiotic directly from the Stonehenge Health website. It sells for $43.95 for a 1-month supply of 30 capsules. That works out to a daily cost of a whopping $1.47 per day. That’s SO much more expensive than your average probiotic. I don’t think the price is worth the value at all and I wouldn’t recommend this product or buy it again. They even try to upsell you with pricier bundles. For instance, 6 bottles for $199.95 or 3 bottles for $118.95. I’m not a fan of companies that do the crazy upsell. Especially because they don’t tell you the final price until it’s in your cart. The only thing they say at first is the price per bottle and the amount saved if you buy the bundle. 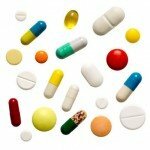 After taking this probiotic supplement, I didn’t experience any bad side effects. No bloating or stomach pain, so that’s good! I saw no improvement with GI function, IBS symptoms, immune function, etc. I also randomly got what I think may be a yeast infection, which is incredibly unfortunate! 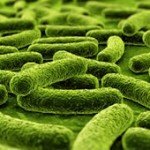 Probiotics are supposed to help prevent and treat yeast infections. So I’m super bummed out that this probiotic wasn’t even effective in that area. Thank goodness Stonehenge Health offers a guarantee for this probiotic because it is incredibly expensive! 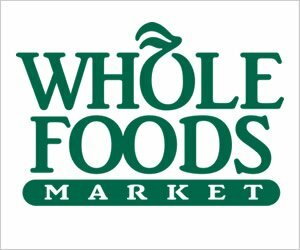 They give you a 90-day, 100% money back guarantee. I’m so happy to see a guarantee in place because I would’ve rated it even lower if it didn’t. If you’re going to spend a high price for a supplement, I expect the company to protect the customer in case you aren’t happy with it. To buy Stonehenge Health Dynamic Biotics, click here.